« Could You Go a Year Without a Clothes Dryer? This entry was posted on Thursday, March 10th, 2011 at 5:09 am by Christa and is filed under Fashion, Green Living. You can follow any responses to this entry through the RSS 2.0 feed. Both comments and pings are currently closed. I’ve seen factory leather tanning in person and you’re right – its a nasty process that uses lots of toxic chemicals so even if the animals are humanely raised and processed the production of leather hides is anything but sustainable. But compare the processing of cotton into fabric, as well as the production of “synthetic” fabrics that now comprise most of the non-fur alternatives for warm weather clothing. Consider the circumstances by which those plant sourced fabrics are farmed, processed, dyed, cut, and tailored into clothing. Most if not all of the cotton grown is GMO (again, major destruction to biodiversity and soil quality there); it’s grown by force, as a “cash crop”, often by people who would rather grow their own traditional foods with which to feed themselves instead; and we all know who is combing, dying, cutting and tailoring that clothing all over the world. They are not well paid and they are often abused there too. Synthetic fibres like polyesters, all that fleece we so love, all those “down” like materials we use to create warm clothing–those production processes pollute bodies of water and create mutation in the aquatic life dependent on those waters. And far more people wear these materials than wear fur. Or even leather. NONE of it is green, but I do see quite a lot of greenwashing going on in all those clothing industries. My point is we like to close our eyes to the reality of the way we live, and the way the things we use are created, often in an effort to appear “holier” than others. In our culture, which is still heavily puritanical, we are all trying to appear more virtuous than others, sinless, and therefore “closer to _______” (fill in the blank as you choose: God, splendour, being correct, whatever). Focusing just on fur and leather detracts from the fact that we do bring about destruction with the way we do things. 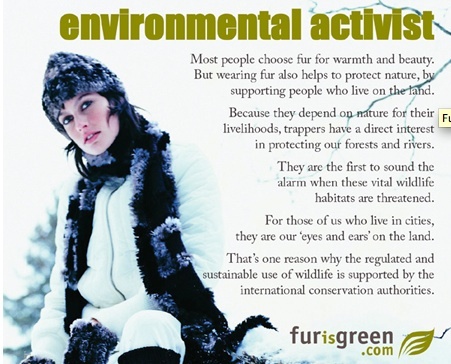 I think fur is like anything else- you have to consider various factors. It’s like meat. Is it better to buy an individually-packaged, preservative-and-sodium laden “chickenless chicken burger” that was produced halfway across the world? Or is it better to buy some honest-to-goodness sausage from your neighbour up the way? Fur farms are not pleasant things, I’m sure- neither is hunting- but if I can get a pair of handmade sealskin mitts when I go to NL to visit a friend of mine, is that really worse than buying a pair of “hotpaws” at Wal-Mart?